In celebration of the 75th anniversary of the Golden Gate Bridge, Open Space commissioned a number of new posts from artists and writers. 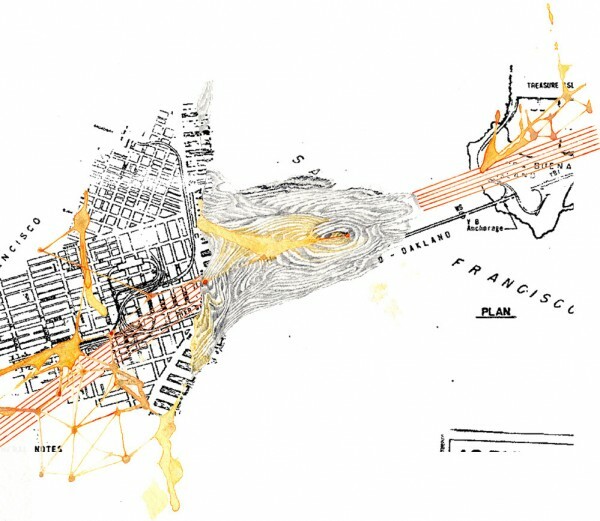 Hughen/Starkweather have spent three years investigating the environmental, financial, historical, and political intricacies of the San Francisco-Oakland Bay Bridge, and their ongoing series of artworks Approach, Transition, Touchdown attempt to reflect the complexities of that monumental structure. Open Space invited them to turn their attention momentarily to the Golden Gate Bridge, and they created five new works for the occasion. Hughen/Starkweather, Traverse 3, 2012. Click image for larger view. Hughen/Starkweather create collaborative artworks that explore the layers, complexities and patterns that comprise a specific place. They research a location using current and historic photographs, maps, data, and personal interviews. The resulting artworks map the unique forms derived from the built systems and natural movements of a place. Among other exhibits, their work has been included in Cartographic Imagination: Mapping in Contemporary California Art at San Francisco State University and commissioned by the San Francisco Arts Commission for the Art on Market Street Program. They were artists-in-residence at Oxbow (CA) in 2010. The artists have been collaborating since 2006, and live and work in San Francisco. Hughen/Starkweather have focused their immense creative efforts on a subject so relevant to our landscape and psyche and done so in a way that creates paintings that stand on their own, irrespective of their reference points. Knowing their source material only further deepens the success of these paintings.